Fire fighters combat wildfires from the Kola Peninsula to Norrbotten as record heat wave continues north of the Arctic Circle. After 31 wildfires in Norrbotten in recent days, fire fighters are tired and need rest. But the danger is far from over, emergency officials warn. The dry warm weather could last for at least another week. Lars Gyllenhaal from Luleå is one of the many who have signed up as volunteer to combat wildfires in Northern Sweden. He says all help possible is need. Gyllenhaal answers his own question: “It is probably ourselves, or more correct, humanity which has triggered the climate changes we suffer from,” he says to the Barents Observer. 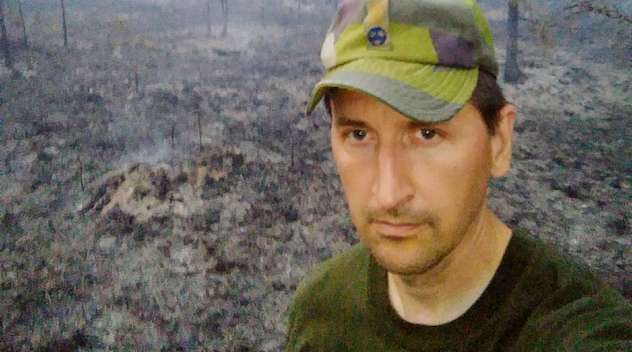 Lars Gyllenhaal has for the newspaper Expressen published a diary about how he experienced the fire fighting in the forests near Jokkmokk, a town just north of the Arctic Circle. Further south in Sweden, thousands of people, volunteers and fire brigades, are fighting the worst wildfires in modern times. In total, about 250 square kilometers are now ablaze at nearly 30 places. Help is coming in from Norway, Finland, Denmark and Poland. Water bombing planes have arrived from Italy. Like in Northern Finland, Russia and Norway, the heat wave in Sweden dries up the terrain and causes extreme danger of new wildfires to start. As reported by the Barents Observer last week, temperatures have been above 30 °C as far as 70 degrees northern latitude. The United Nations Framework Convention on Climate Change links the wildfires to the ongoing climate changes. ”Once relatively fire-free, Arctic areas are now likely to become more susceptible to fires because of #ClimateChanges,” a tweet with photos from Sweden reads. On Russia’s Kola Peninsula, more than 40 square kilometers have burned, the Federal Forestry Agency reports. Currently, seven wildfires are burning and emergency authorities have called in help from other regions like Arkhangelsk, Vologda, Komi and Karelia. “The wildfires are extremely difficult to combat,” the agency informs. Emercom, the Ministry of Emergency Situations, has stationed a water-bombing plane at the airport in Murmansk. Additional to the forest areas near the border to Finland, forest fires are currently burning near Olenegorsk and Monchegorsk south of Murmansk and in the Pechenga region near the border to Norway. 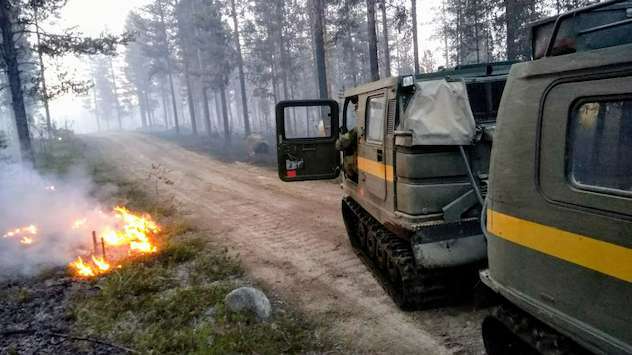 The largest fire on Monday, according to the Ministry of Emergency Situation, is in the forest near Alakurtti not far from the Salla border checkpoint south on the Kola Peninsula. This weekend, a wildfire in the Lotta area spread across the border to Finland at Raja-Jooseppi. Firefighters managed to extinguish the fire, but also other places in Finnish Lapland have suffered from wildfires. Finland is still on alert, although some showers on Sunday and Monday have slowed down the spreading, YLE reports. Lars Gyllenhaal in Sweden says there is no time to relax. “The danger is unfortunately not over yet and all volunteers are needed, as well as all help from our neighbors,” he says. 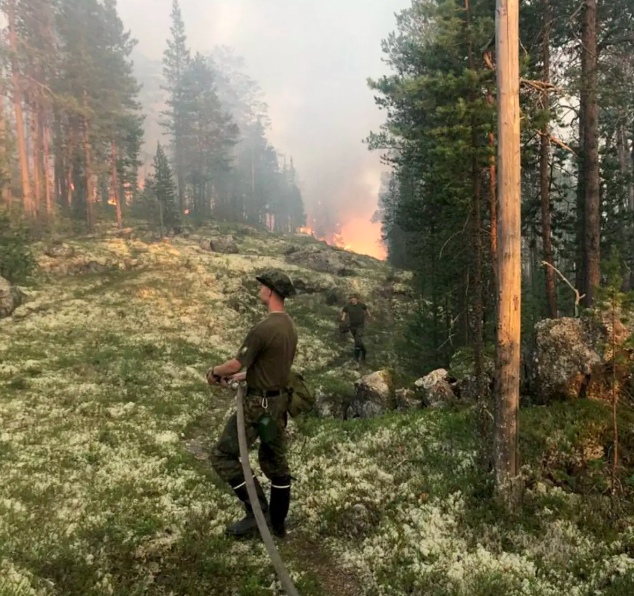 Shortly after talking to the Barents Observer on Monday evening, yet another wildfire was discovered near Jokkmokk, Norrbotten Socialdemoraten reported. The newspaper informs that there have been 31 wildfires in Norrbotten recently.